Note: I know that this post is rather lengthy. However, instead of dividing it into separate posts, I wanted to put everything we did with this book in one place so it was easy for people to find at a later date. My intent was not to overwhelm anyone with its length. My hope is that you will find some ideas and inspiration here for your own Mike Mulligan journey. 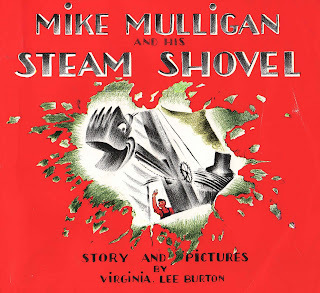 This week we "rowed" the book Mike Mulligan and his Steam Shovel by Virginia Lee Burton. One of my goals with Five in a Row is to help create some fun memories tied to great literature. So to make things fun, I had them guess what book we were going to "row" this week. 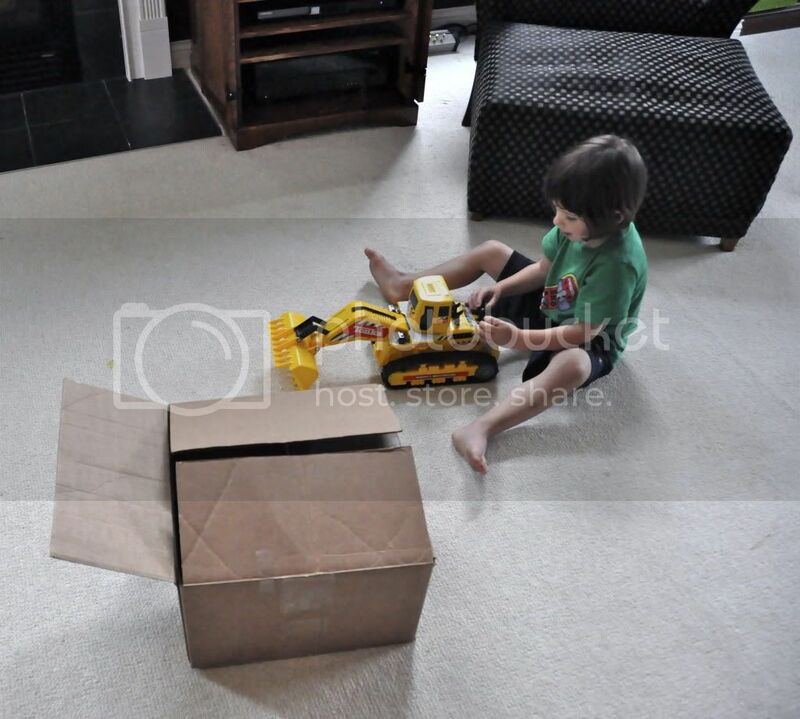 As a hint I wrapped up a toy excavator in a box and had them open it. This was something I picked up at the thrift store awhile back. I liked the anticipation this created for our week long theme with the book. I am going to try to do this every week as time allows. After we read the book for the first time, the kids spent some time trying to work the levers that control our own "steam shovel". I know, I know it is not really a steam shovel. But try to use your imagination! 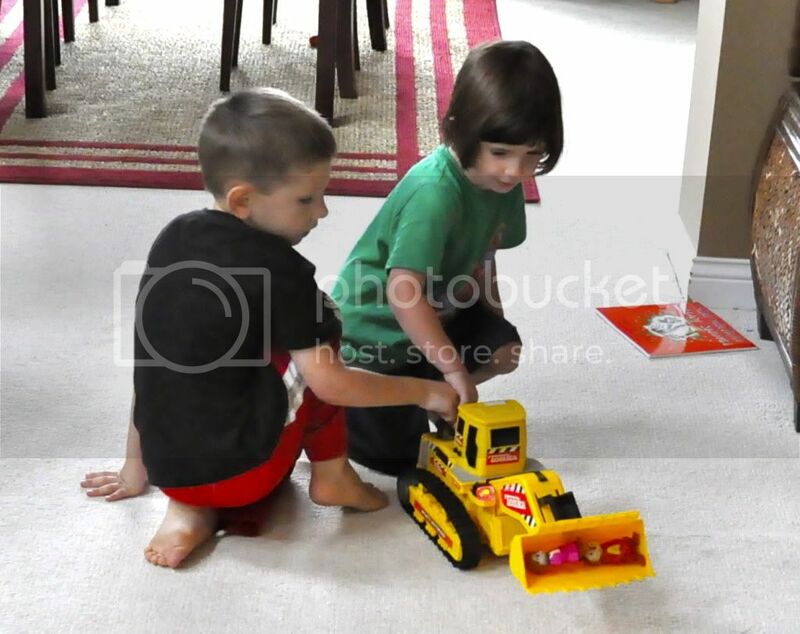 :) They used their steam shovel to scoop up their chipmunk toys and move them across the room. You can't exactly read a book about a steam shovel if you don't understand what steam is. So we spent a few days this week talking about the states of matter which led us to a nice discussion about the water cycle. After that, we read the book A Drop Goes Plop by Sam Godwin. This book does a wonderful job of explaining the water cycle in a way that even very young scientist can understand. The book is also pretty funny. I enjoyed reading the dialog between the mommy seal gull and the baby sea gull. After reading this book, the kids watched The Magic School Bus Wet All Over. (It is one of three shows on the The Magic School Bus: Catches a Wave DVD. It is also available as a standalone VHS if you have a player.) We learned some new vocabulary words including evaporate and condense. I am a big fan of the Magic School Bus series. I think it does a great job of explaining science topics in an entertaining way. After we watched the movie, we did a couple of very simple science experiments to re-enforce what we learned. 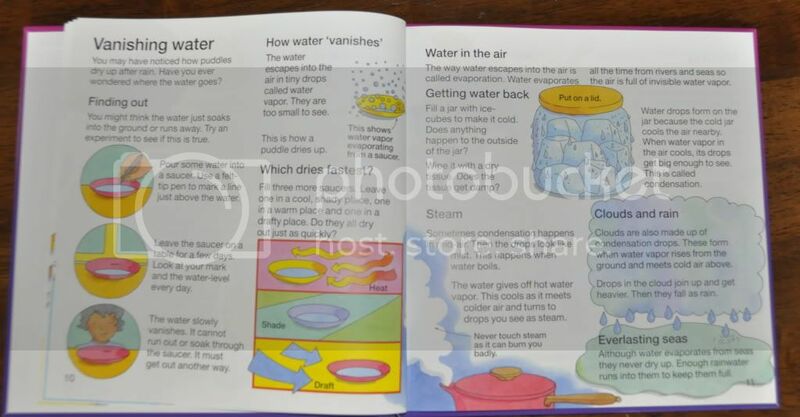 The science experiments came from the The Usborne Book of Science Activities, Volume One , pages 10-11. 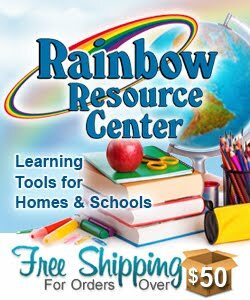 This is one of our books from Sonlight, and I have to say that this is a FANTASTIC science resource to have in your home. The Usborne books are very nicely illustrated and do a great job of describing concepts to visual learners. The experiments are also very clever and can usually be done with things that you have around the house. The Usborne Book of Science Activities is wonderfully illustrated and contains simple experiments that you can do at home. These page explained the water cycle to the children. On another day, we started to talk a bit more about how steam can be used to power things. 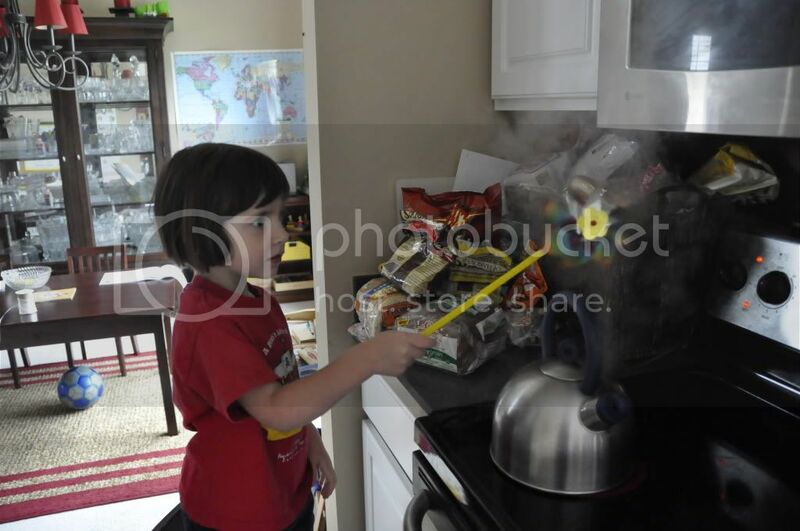 To illustrate this in a way that a 3 or 4 year old could understand, I put the tea kettle on and we watched how the boiling water could actually turn a pin wheel. We also talked a bit about how when water is heated it expands building pressure. I also stumbled upon a GREAT resource for explaining steam power from our local library. it is a short video called The Way Things Work: Steam Power . It is an animated movie where some kids need to find a way to power the rides and attractions at their fair. They turn to steam power and the book does a great job of illustrating the basics of steam engines. I am not sure how much Marcus and Sophie got from this video. (It is probably more geared toward older kids.) 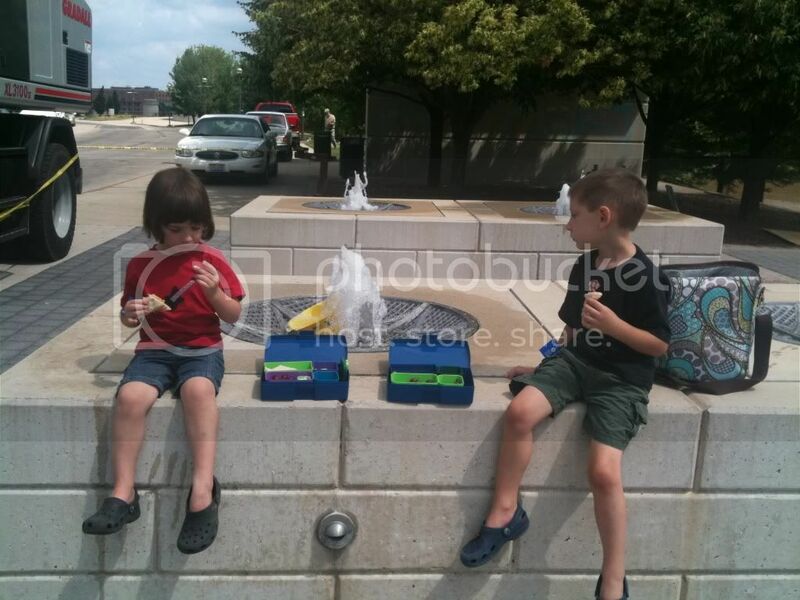 However, I heard them explaining steam power to their dad one night...so obviously they got something from it. If you have older kids, I highly recommend checking to see if your library owns a copy of this video. Social Studies- What is a furnace? How is a house (or in our case a city hall) built? It was during this discussion that I found out that the kids didn't know what a furnace was. (I took it for granted that they knew what a furnace was. So I was surprised when they asked about it.) So we took a trip down to the basement (aka our "cellar", one of our vocabulary words this week) and we checked out our furnace. 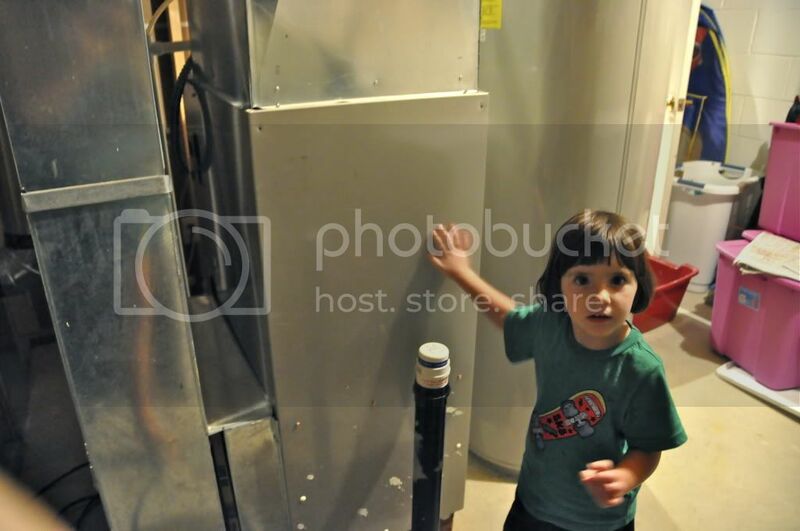 We also went around the house looking at all of the vents and talking about where the hot air came from in the winter. I also pulled out a book from our Sonlight curriculum called What Do People Do All Day by Richard Scary. This is an awesome book to have on your shelves. I find that I am always pulling it out to describe various things to kids. On page 9 & 10 of this book there is a wonderful description of how a house is built which tied in nicely with our Mike Mulligan discussion. It also does a wonderful job of explaining how a furnace works to heat and cool the house. Good stewardship is taking care of the things we own and the resources we have to use. We went to the picture of the book where all of the other steam shovels were being scraped for junk. Then we discussed how Mike loved his steam shovel and took good care of it. Because he cared for his steam shovel, she lasted for a long time. While other steam shovels were being scrapped, Mary Anne could still dig "as much in one day as a 100 men could dig in a week." In the book, Mike Mulligan and Mary Anne and some others help dig the canals for the large boats to come through. Canal became one of our vocabulary words for the week. We also located one of the most famous canals (The Panama Canal) on the map and put a story disc from Mike Mulligan and his steam shovel on it. I am not sure if the fictional Mary Anne actually was supposed to have dug this famous canal...however, I hoped it would help the kids remember what a canal was. We added the following vocabulary words to our word box. We also discussed what the literary technique of personification means. While reading the book, Marcus and Sophie kept asking if the steam shovel "could talk". (I think because the steam shovel had a face and even a mouth.) So we discussed that the author used a technique known as personification where she gave human attributes to a thing. (In this case, a steam shovel was given human features and a personality.) We spent some time flipping through the book and looking at how Virginia Lee Burton illustrated the different expressions on Mary Anne's face. Mary Anne is a very expressive steam shovel! 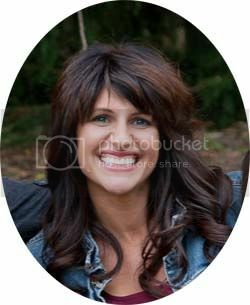 She is illustrated with many different facial expressions showing a wide range of human emotions. She is also an excellent example of personification. Alright, this is the one resource that I found that I was SO excited about. There is a series called "Stories in Music " where they attempt to introduce children to music by composing music for the story while a narrator reads aloud the book. Well...they have one of these for Mike Mulligan and it is awesome! This CD tells the story of Mike Mulligan using an original composition of music played by the London Philharmonic Orchestra. (Very similar to how the story Peter and the Wolf is told through music if you are familiar with that.) I was surprised that I have never heard this CD mentioned on any of the FIAR message boards or blogs. 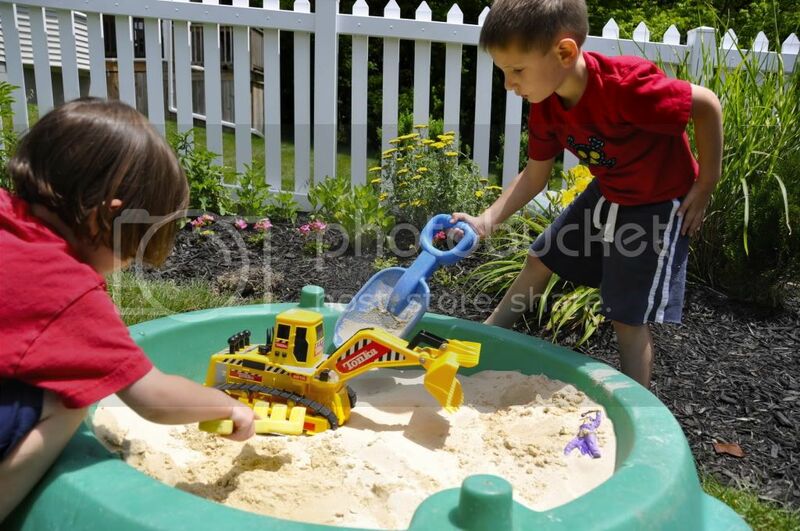 I finally got around to cleaning out the kids sandbox and filling it with new sand. I then put a couple of "steam shovels", bulldozers, backhoes, and other trucks in the sandbox hoping to encourage them to re-enact the story we read. Marcus decided to do his own version of the story. The sandbox became Egypt. And from what I overheard, the trucks had uncovered some mummies and sand monsters. 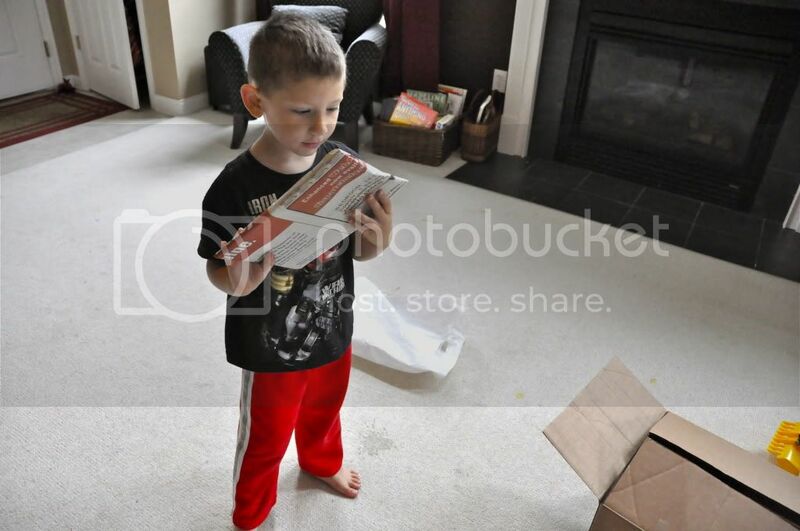 A few moments later, he ran downstairs and got several toy dragons and they were added to his "Egypt". 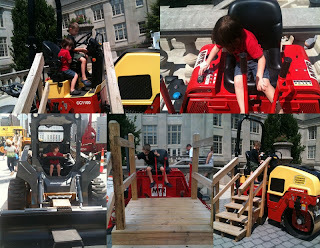 Our local science museum had an exhibit this week called "The Science of Big Machines". And to tell you the truth, this is one of the reasons I decided to row Mike Mulligan this week. 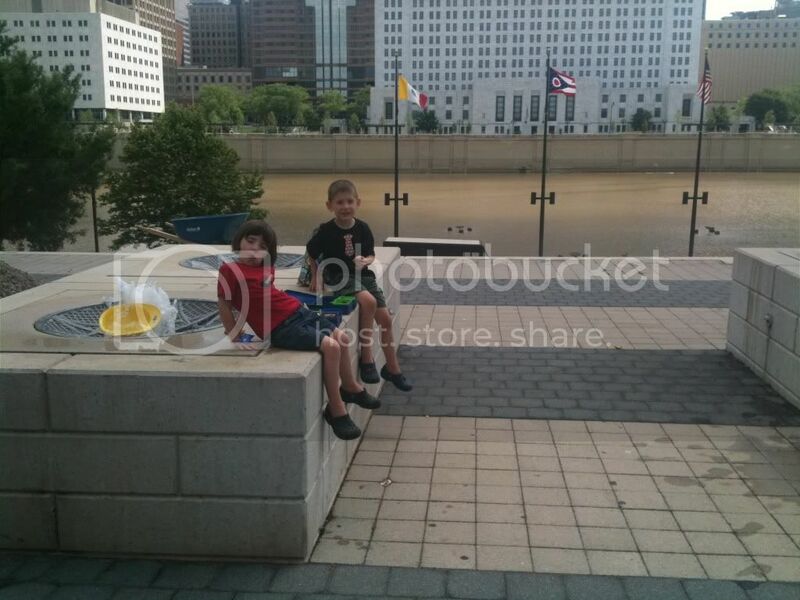 I thought it would make an awesome field trip to go along with the book. When the kids arrived at the exhibit they were given yellow hard hats to wear. 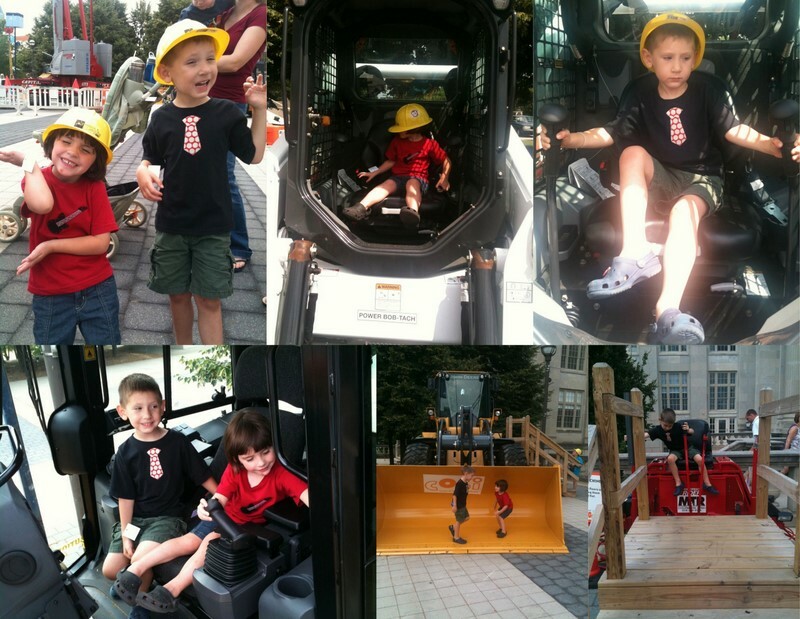 They then got to walk around and experience some BIG construction machines up close and personal. The best part of the field trip was when Marcus and Sophie got to operate a real diesel excavator. (The modern day equivalent of a Steam Shovel.) They used the excavator to dig a hole and then smooth down the dirt again. Here is a picture of Marcus running the excavator. 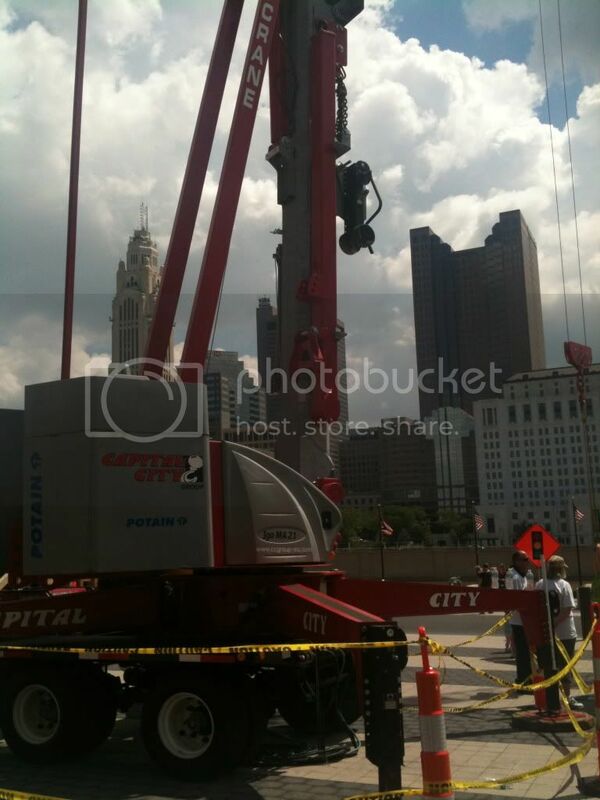 Another highlight was when Marcus was lifted off the ground by a giant crane. The crane was SO big that no matter how far I stood back I couldn't get it all in the frame of the camera! 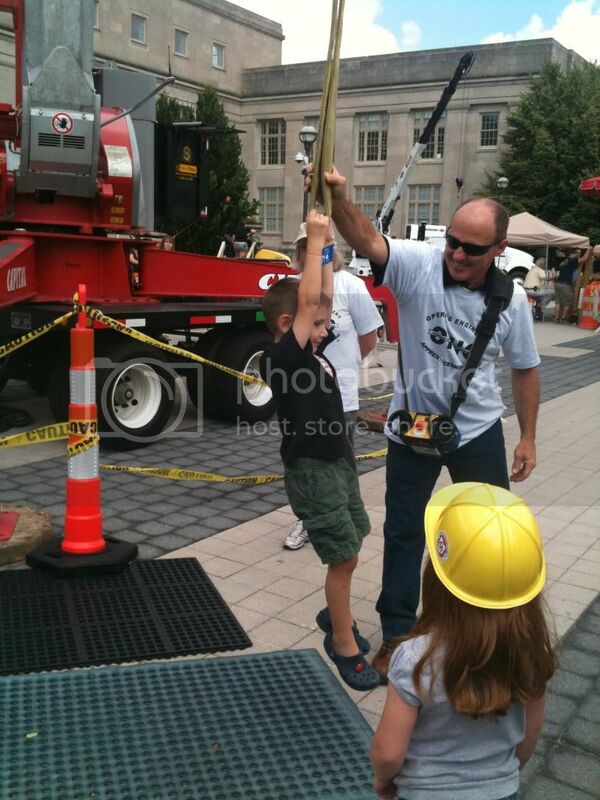 Here Marcus is being lifted off the ground by the crane. 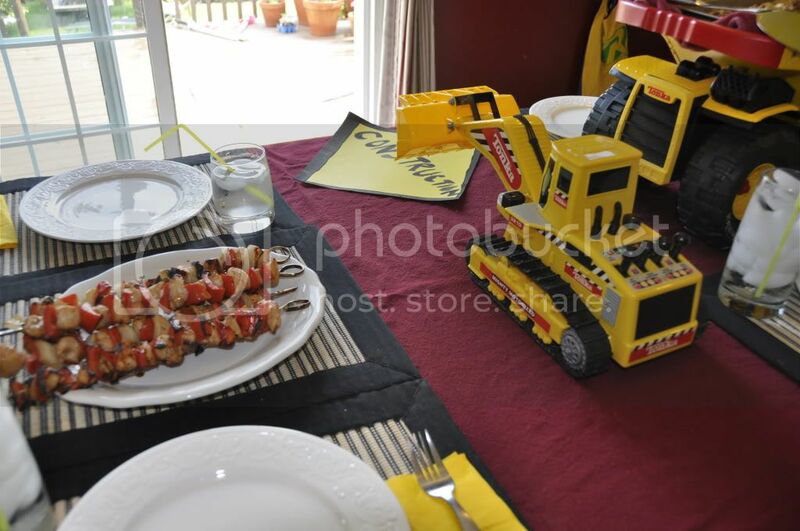 The kids even got a chance to eat a box lunch "construction worker" style. We all had a great day together. On Friday, the kids helped me to throw a Mike Mulligan party. 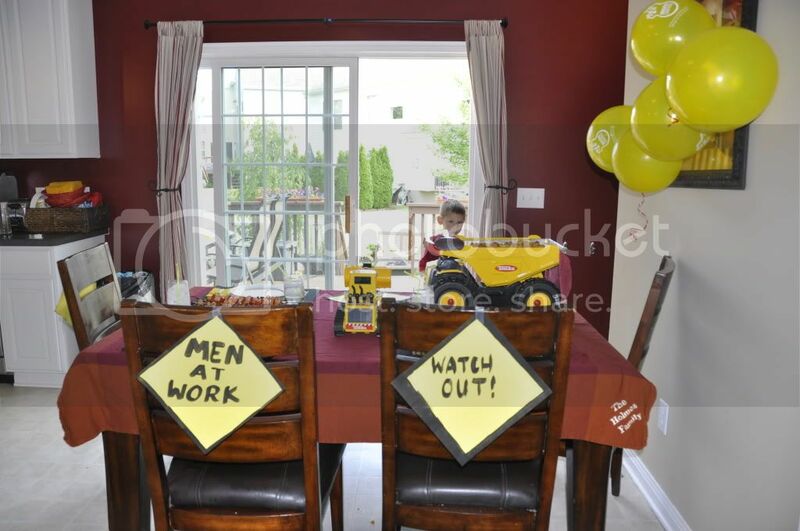 It was going to be Father's day this weekend, and we are always looking for excuses to have a party. 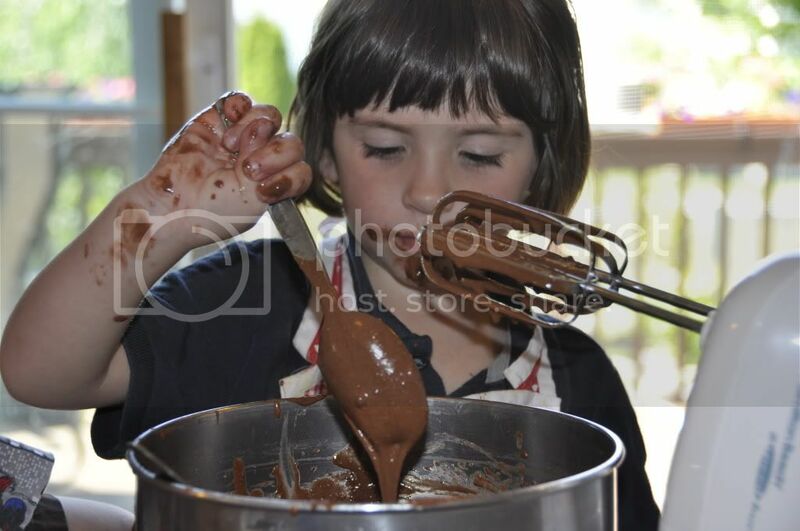 We started the afternoon off by baking a chocolate cake for our party. After the cake baked, we layered it with dirt (aka crushed Oreo cookies) and mud (aka Chocolate moose). In the story, Mary Anne digs the cellar of the Popperville town hall with "four corners neat and square". So the kids helped me cut out a square in the center of the cake to represent our cellar. 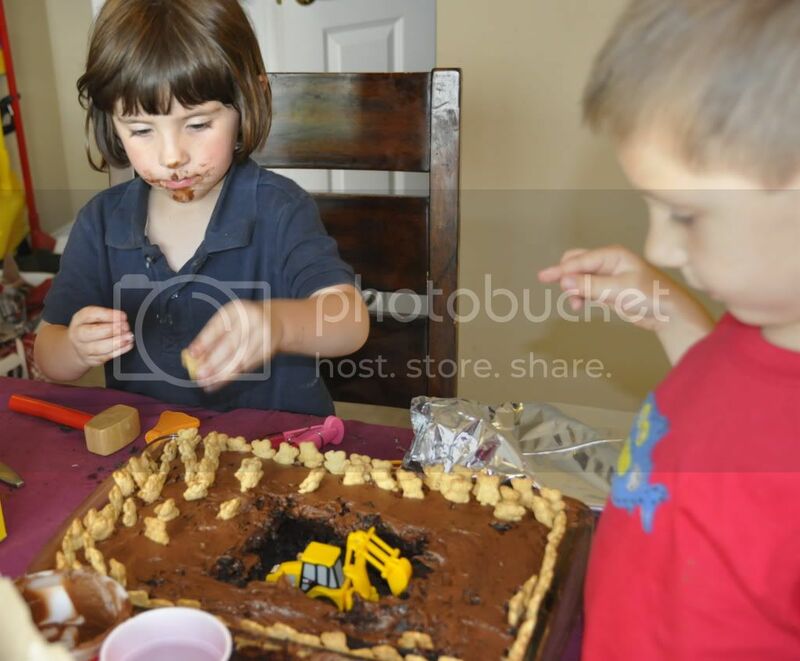 We also used Teddy Graham cookies to represent the people of Popperville who stayed to watch Mary Anne as she dug. 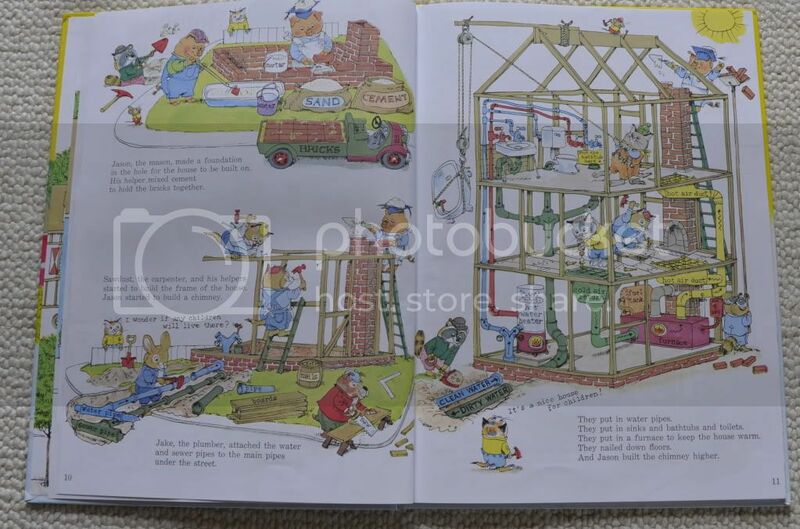 We put a little toy "steam shovel" in the bottom of our cellar (Mary Anne) and another bear that we said was Mike Mulligan in the cellar with her. Now the cake is supposed to look like this cake. However, Marcus reminded me that the citizens of Bangerville and Bopperville and Kipperville and Kopperville all came to watch Mary Anne dig too. Therefore, he said, we were going to need A LOT more bear cookies on our cake. 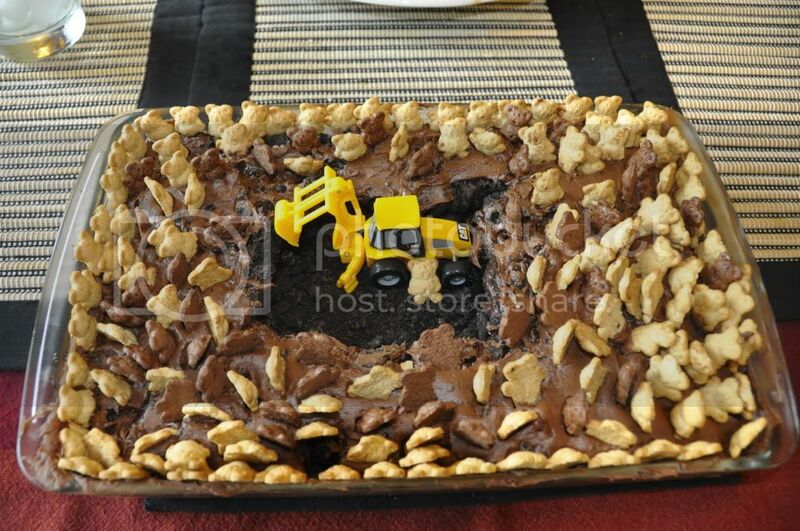 Perhaps not the prettiest Mike Mulligan cake on the web. 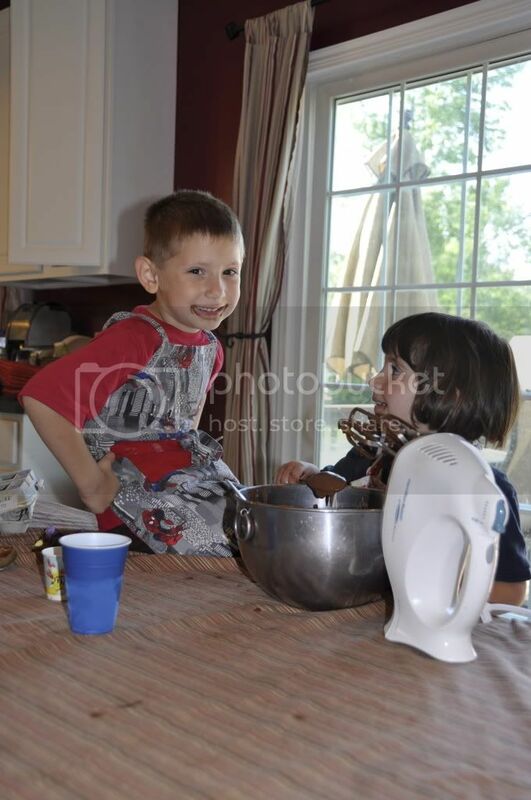 However, the kids enjoyed EVERY second of making this cake. 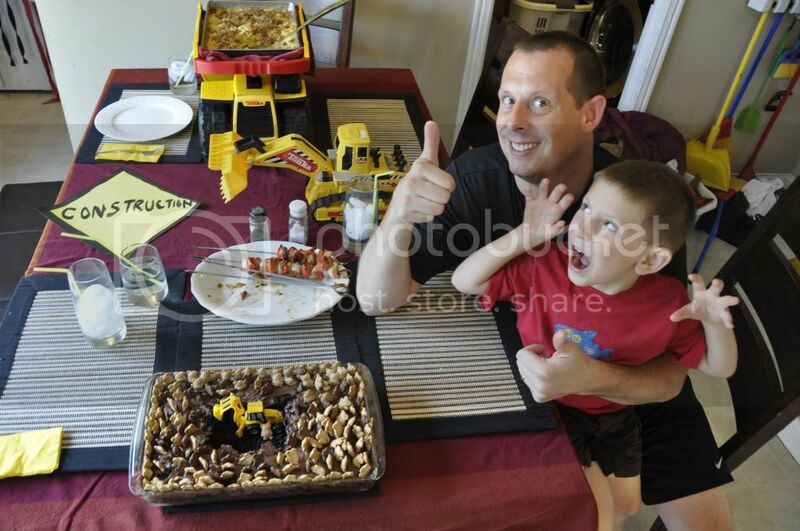 I also made "Dump Truck" Macaroni and Cheese. (It was basically baked Macaroni and Cheese made with noodles shaped like wheels. I also sprinkled it with a mixture of Italian bread crumbs and melted butter before baking to represent sand...and also to make it taste YUMMY!) 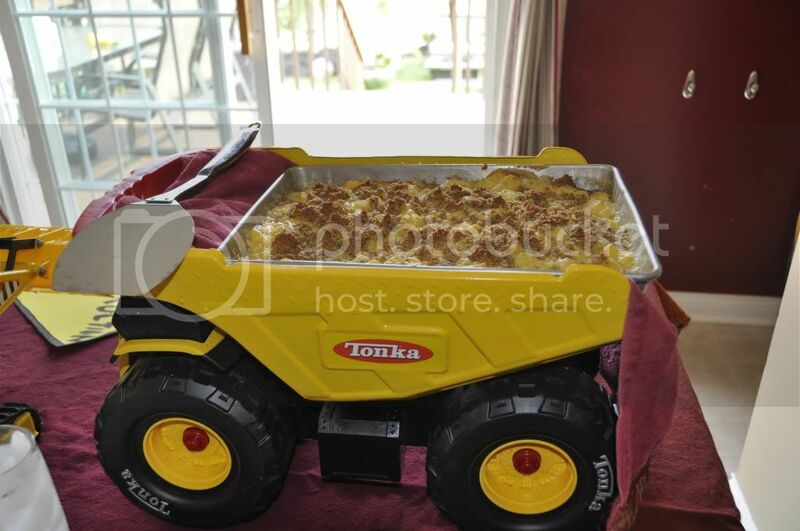 I served the dish in a pan in the back of a toy dump truck that we owned. Our dinner was completed with some boulder kabobs (chicken kabobs made on the grill). 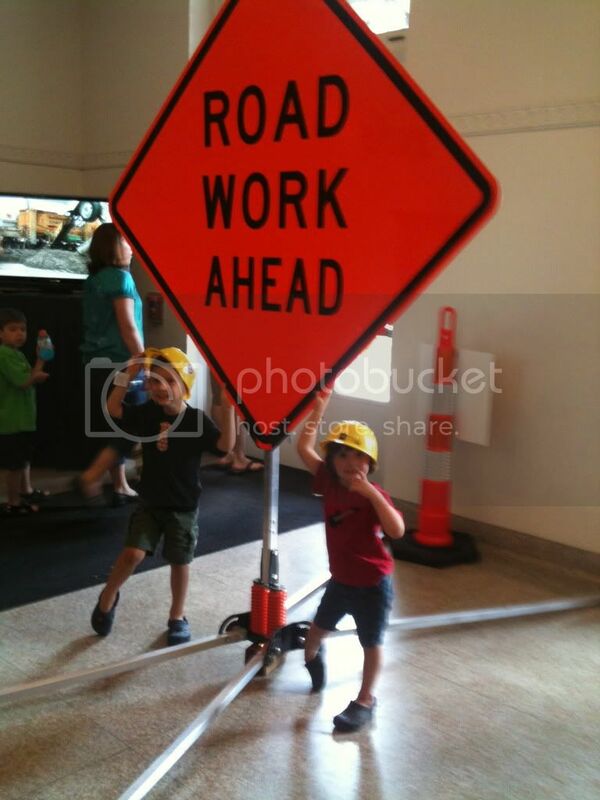 The kids also helped me paint construction signs using a piece of poster board. And we blew up some balloons that we had left over from a birthday party. 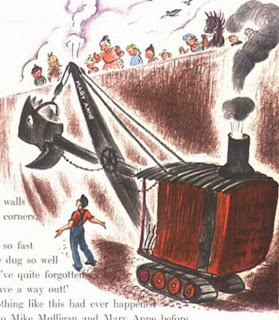 Well everyone, that wraps up our week with Mike Mulligan and his Steam Shovel . I hope you have your own adventures with this wonderful book! What a fantastic week! You are making me miss our FIAR days, we loved it too! You are motivating me to make more time for it in our school schedule. We just got Mike Mulligan from the library, and I am reserving the Stories in Music, which they have, too. Never heard of these before! You have inspired me to do a few extra activities with the books - thank you!!! Wow. You have inspired me to do more with my little one. Thank you for sharing ! Love these ideas...will be earmarking this one. We will be studying Mark Twain and the Erie Canal this next week so I will definitely be using some of your steam ideas. I love 5 in a Row! 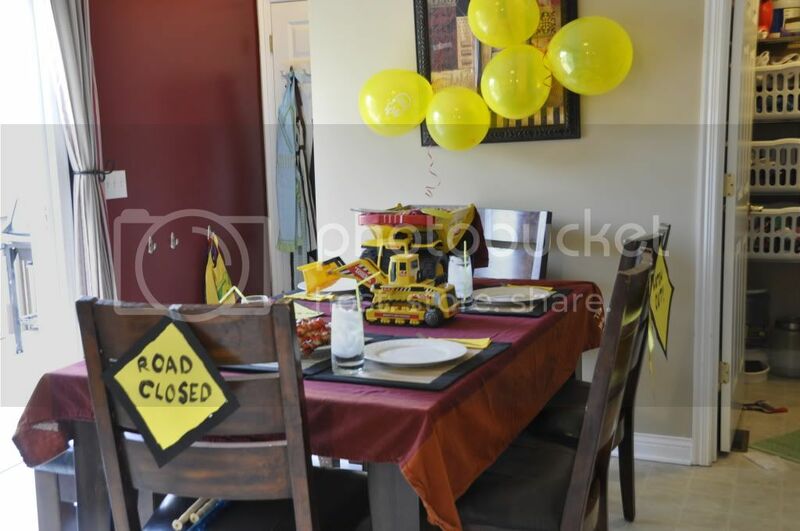 I love all the fun, food dinner parties I see people doing with it. 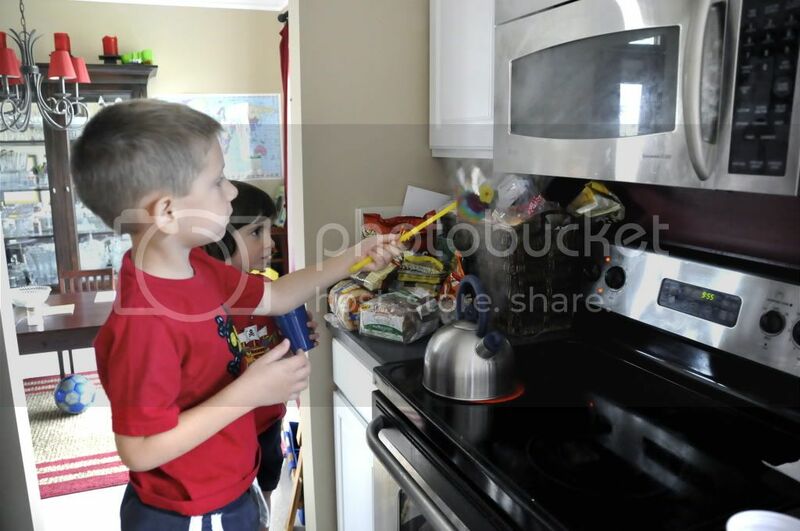 I've been telling myself I need to get the kids involved more with cooking (I need to be involved more with cooking lol), and this would be a really fun way to do it. It looks like a fantastic week. Thank you for sharing! Wow! Loved the post and definitely inspires me for our upcoming FIAR adventure! Thanks for such great ideas and blogging about them! Oh, we adore this book and many other stories by this author! Thank you so much for sharing all your wonderful ideas!! What a fantastic learning week you had. I will have to do something similar with my kids soon. Thanks so much for all the wonderful ideas!!! Awesome post!! We love Mike Mulligan and FIAR! We will definitely be using a lot of these ideas! Are you doing the actual Five in Row series or just using the ideas? 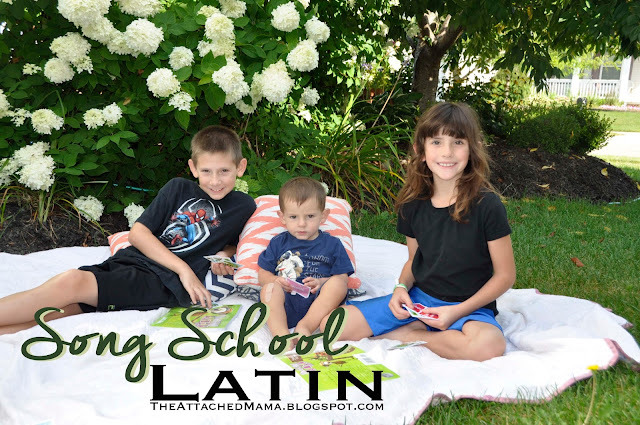 I've just recently ran across this idea and am throwing around ideas for planning for the fall. Looks like you had fun and did a lot!!! 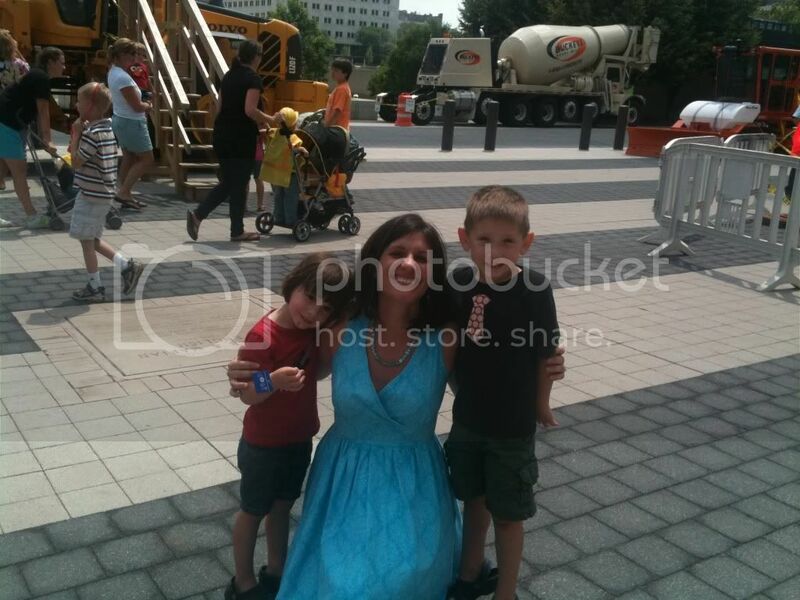 Wow you are a really cool mom. Love the cake and mac & cheese. Great week!! Wow! Now that is creative. We just read the book yesterday, and I did nothing else. LOL! ;) This is one of the books from the same author that we like the best. Very impressive how you pulled everything together for this story, even a field trip! I bookmarked this post for our own FIAR trip with this book. Wow! I'm so impressed with all that you did! 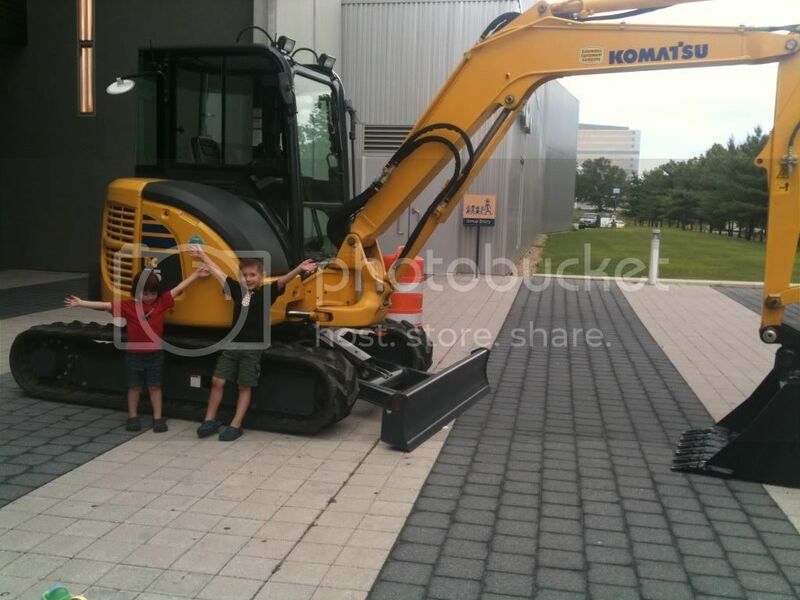 My older boy would have been in heaven operating that digger on your field trip. Thanks for all the ideas! We will be rowing this book soon, and I love all your creative projects. I'm adding you to my list of resources.